As I was walking up to the register at Michaels the other day, I passed a display of paper mâché witch hats and pumpkins and was immediately struck with inspiration! One of those witch hats was looking right at me, saying “Don’t I remind you of something?” Of course it reminded me of something; that hat was just waiting to be transformed into a Harry Potter sorting hat! I started with a paper mâché hat I found at Michaels. All it’s missing is a face! 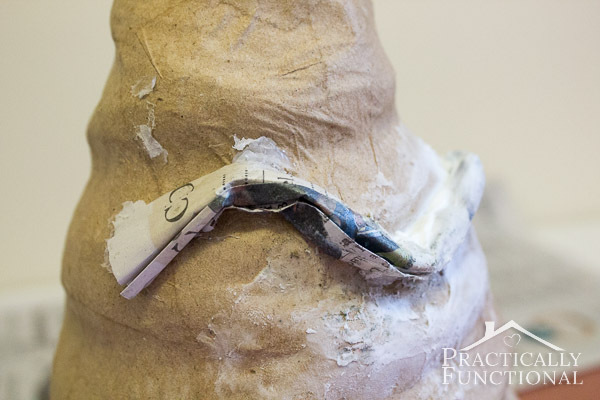 The first step is to add the basic features using newspaper and hot glue. This part does not have to be perfect or even pretty looking; the newspaper just makes the face 3D and gives you some depth to work with. 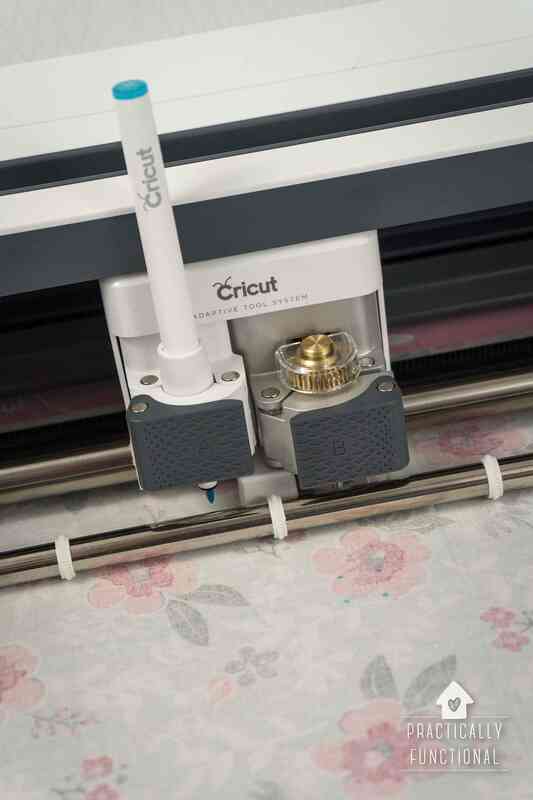 You will go over the newspaper later with modeling paste, which will smooth everything out, so don’t worry if there are weird folds or seams or sharp corners in your newspaper. 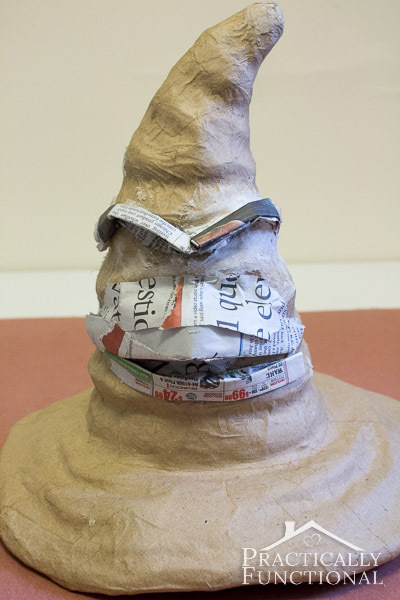 As long as your hat starts to look like a sorting hat once the newspaper is glued on, you’re good to go! 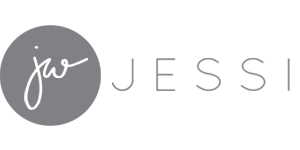 For the eyebrows I started with a rectangular piece of newspaper, about 8″ x 6″, and folded it up into a long skinny line. I bent the newspaper into two arches (kinda like an upside down W) and then used my hot glue gun to attach the newspaper to the hat in a few strategic places. Remember, you’ll smooth out the weird folds and creases later, so just focus on getting the basic shape the way you want it. For the nose and mouth I made a flat ball of newspaper and glued it on where his nose should be. Then I glued on two smaller, flatter balls on either side of the nose to make “cheekbones” to make the upper lip look beaky. Cover the beak with a few long strips of newspaper to give it a flat, smooth surface. Make sure to cover the underside of the beak as well. I made a bottom lip by gluing another long folded strip of newspaper underneath the beak. This part doesn’t need to be nearly as three dimensional as the upper beak, so you can get away with just a single strip of folded newspaper here. When I was done, this is what my hat looked like. You’ll notice that there are still gaps and seams in the newspaper, and that some of the newspaper doesn’t lay perfectly flat or smooth. Again, this is fine! You’re just giving yourself a basic 3D shape to work with. Once your newspaper is in place, add modeling paste to cover the newspaper and smooth out the seams. I just used my fingers to apply the modeling paste and smooth it out, but if you have ceramic or pottery tools you can use those if you want to keep your hands clean. Cover all the pieces of the newspaper with a thin layer of modeling paste, and start smoothing out the seams between strips of newspaper. 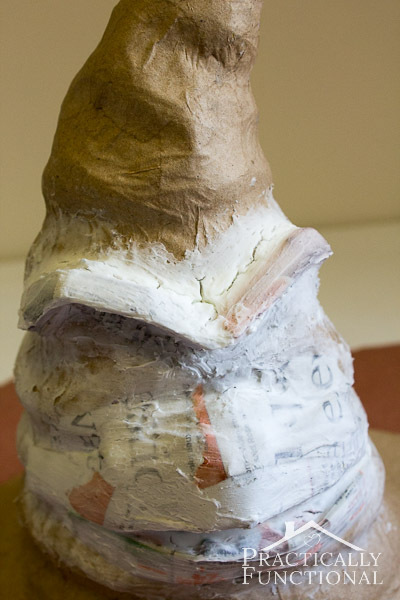 Fill in the gaps between the newspaper and the hat with modeling paste and smooth those out as well so there’s a seamless transition between the paper mâché of the original hat and the extra newspaper features you added. 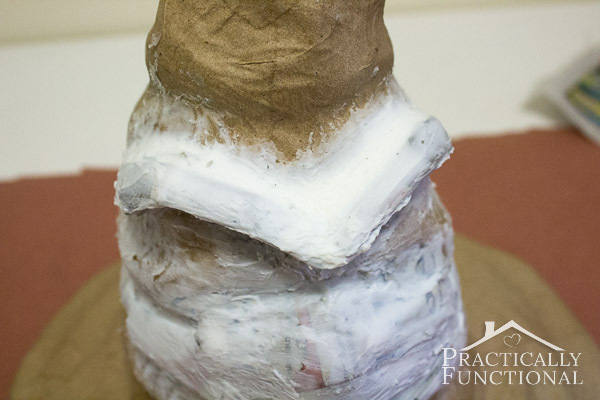 Don’t worry too much if the modeling paste isn’t perfectly smooth at this point; you’re going to apply a thin second coat later to smooth out any imperfections. Also, this is a sorting hat; it’s old and wrinkled anyway, so it’s not going to hurt it to have a few extra lumps or bumps! Once the gaps are filled and mostly smoothed out, set the hat aside to let it dry for at least 4-6 hours (I let it dry overnight). The modeling paste shrinks a bit as it dries, so if you had any areas where your paste was pretty thick, you may see some cracks. This is why you need to do a thin second coat of paste. Apply a second coat over any cracks to fill them in, and over any bumpy or rough sections from the first coat. This time, take care to smooth the paste as you apply it. 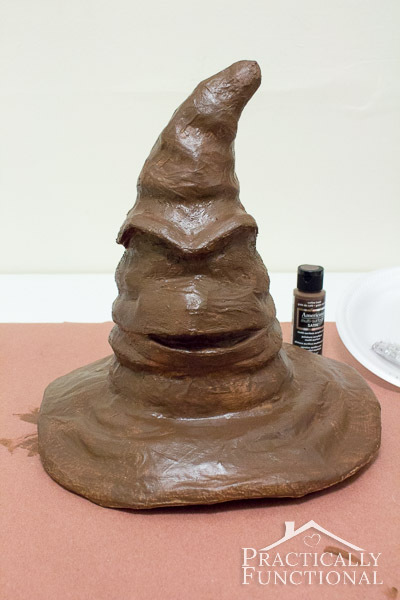 Let the second coat of modeling paste dry for about 2 hours, and then give your hat a coat of paint. I used Americana multi-surface acrylic paint and it stuck really well to both the paper mâché and the modeling paste, but you will probably need more than one coat. You can see in the photo below that my first coat didn’t quite cover the modeling paste everywhere and some of the white still showed through. But the second coat of paint did the trick and after it dried, the hat was finished! Now I have my very own paper mâché sorting hat! And a sorting hat is the perfect Halloween decoration too! 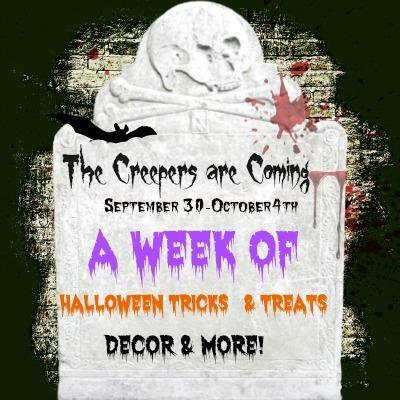 If you’re looking for more Halloween ideas, a bunch of awesome bloggers are sharing Halloween-themed decor, recipes, crafts, and more throughout this entire week! 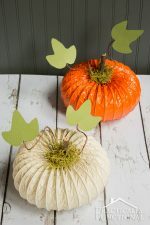 Click on any of the pictures in the image gallery below to see the full tutorial for that fun Halloween project! 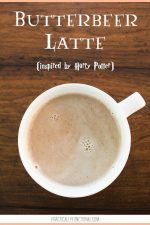 The Easiest Way To Make A Delicious Butterbeer Latte At Home! 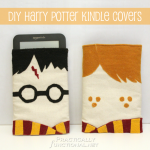 DIY Harry Potter Kindle Covers! WOW girl that is awesome!!! Seriously you did an incredible job on this project, Home run! That’s amazeballs! I want one!!! WOW girl this is awesome! Very clever of you. *stands clapping* Bravo, Jessi. This. Is. Awesome. How cool is this? Awesome job Jessi! 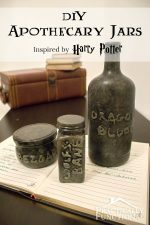 I want to make this with my girls, especially my teen, who is all about Harry Potter! Thank you. Great job, Jessi! We must be on the same wavelength. I posted a Harry Potter project today, too. I’m working on some Harry Potter party posts. I’ll definitely be directing people here for a way to make the hat. Thanks so much! (Wish I had this when I did the party!). Great job! Ooh awesome, I’m gonna go check it out! And thanks in advance for the shout out! This turned out SO perfect!! Pinned! Very cool! Pinning this for later use! Aww thanks Vanessa! I always wanted to be in Gryffindor! Cool! My daughter and I thought “sorting hat” when we saw these at Michael’s too, but you made yours awesomer! They really just look like sorting hats waiting for faces, right?! Thanks Steph! That is awesome! I love Harry Potter, and your hat is perfect!! Awesome, have a ton of fun with it! 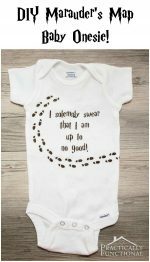 This is so clever and fun – my Harry Potter fanatic relatives would love this! Would love if you linked this up to my Craftastic party. Going to pin this one for sure! I love Harry Potter!! Fantastic! It totally reminds of that now that I see your hat! How fun!!!! I just made a witches hat with mine that I will be sharing soon! Wow! Amazing job… I love this so much! This is amazing! I LOVE Harry Potter. I feel like if I made this I would just sit at home with it on my head all day pretending I was at Hogwarts! LOL, that is a brilliant idea! I haven’t tried it on yet, but the paint is dry now so I can! WOW I totally love this. I thought it was chocolate! Great idea! I didn’t even know they made paper mache witches hat…now I’ll have to go look for one. We are definitely Harry Potter nuts at our house. Wow! I bought this hat last week to use at a Cub Scout Halloween party. I immediately thought it would make a great sorting hat. So glad I found your tutorial. Thanks so much for sharing! Oh I LOVE this sooo much Jessi- huge HP fan. Pinning!! Thanks for sharing this fun fabulous idea!! Um, AWESOME! 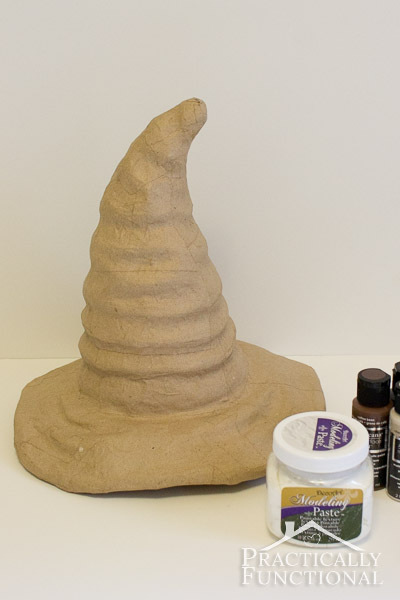 I never would have thought to create the sorting hat that way– so cool! I love all the HP stuff that comes out at Halloween. It makes me want to go back and read the series all over again. Thanks for sharing your amazing project, Jessi! I love rereading that series. I’m pretty sure I reread it about twice a year! I’d love it if you linked up with our weekly link up party and shared this amazing craft! You were my feature last week and I forgot to come by and tell you! Better late than never! This is such a great idea!! Nice job. Thanks for linking up at Romance on a dime!! What? What! What? What! What? In the greatest way possible. Ever. You know this means I HAVE to feature you on Thursday. Thanks for sharing it at the Pinworthy Project Party! It looks great. I love seeing what people can do creatively with simple materials. this is awesome jessi!!! i love HP!! xoxoxo thanks so much for linking up at The Humble Brag last week and hope to see you back tonight! Ran across this on pinterest…I work for michaels and ever since those came in this year I’ve thought the same as you, I couldn’t pass them without thinking of the sorting hat. Nice to see the idea realized, great job!